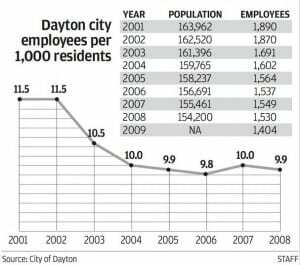 From 2001 to 2008, Dayton’s population declined by nearly 10,000 — from 163,962 residents to 154,200.
via Pay freeze, layoffs possible for city workers. My whole quest for public office began in 1986 when as a new homeowner in a seemingly decrepit part of town, I went to city hall to find out how we could have a “Historic District” with special laws- with no signs and no covenants in the deeds? It was like talking to a wall. Instead of thanking me for buying a home that had been on the market for 2 years- losing a third of its asking price, and moving out a clan of tenants who did wonderful things like pooping in a pizza box and locking it in the closet- I was ignored and prosecuted for fixing it up (putting on the wrong style of garage door). I tried to tell the commission then that this wasn’t the way you treat the customer, or you won’t have customers. In the last 7 years- roughly, the time that Rhine McLin and Joey Williams have been on the City Commission, Dayton has lost about 9,000 taxpaying residents, and countless more taxpaying employees. This is, to quote old Ford advertising “Job 1”- to make Dayton a place where people want to live and work. This should be the primary, if not the only measure of our leadership- net increases in residents, jobs and tax base. My formula is simple: Hire the best City Manager/CEO we can afford, set goals and objectives, measure performance, adjust course as necessary. It is the job as a commission to guide and advise, hire and fire the City Manager and not much else. He or she, should be the clear captain of the ship. It’s not about the commission, the mayor- it’s about the Captain and his crew. When it comes to statements about safety- I want to have Chief Biehl at the microphone, not Gary Leitzell or Rhine McLin. When it comes to marketing our community, I want the City Manager and the heads of the Chamber of Commerce, the Dayton Development Coalition, Citywide Development etc. You notice I didn’t say the “city head of economic development?” That’s because I don’t believe that “economic development” is done as a separate function of government anymore than service is a separate part of running a restaurant. Everything the city does- has to be the greatest good for the greatest number. We have to strive to use what we have, to create the most livable, safe, comfortable, friendly city we can. When we do that right, people will move back, jobs will follow and the transformation will begin. I hope to be a part of the City Commission that puts these principles into practice. Previous Post: Esrati campaign poster for sale. To make Dayton a place where people want to live and work. By God, I think he’s got it! Yes! This is exactly what I meant. Distill your ambitions into one sentence, so that you can knock on a door or meet someone on the street and say “I’m David Esrati and I am going to make Dayton a place where people want to live and work.” In the campaign for O. we stopped handing out position papers in the last two months, and focused instead on getting people to the polls. We had brief answers to questions about complex problems. You can expand on how you want to do it, or the steps to getting there, but this is a laudable goal, appropriate for the office and something that people on both sides of the river want to hear. Good going, well done. That’s an interesting graph. It seems to say the city government is doing a good job of downsizing along with the population. BTW, population loss is a long term thing in Dayton, starting with the decade between 1960 and 1970. The greatest drop was between 1970 and 1980, and then on a lower downslope since 1980. I’d also like to see heads of small and large businesses come to the microphone and say how great it is to do business in Dayton. I’d also like to see neighborhood residents talk up the advantages of living and working in Dayton.